So many things going on this week. I feel exhausted! But let’s start from the beginning. This Sunday starts the Teacher Appreciati​on Week Sale on TPT. And it lasts three days! Don’t forget using the code to get an 10% extra on my already discounted store. My Summer craftivity kids. Two swimming kids that will hold our students’ best works. I have been trying to get my Summer Fast Finishers pack ready for the sale, but… I just can’t do it… So I am uploading a small part of it. 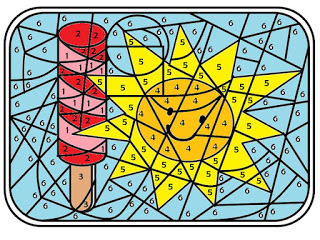 A color by number activity that you can download for free. Thanks for stopping by and have fun on the sales, I will! Next week is Teacher Appreciation Week, and Sunday, May 6th is sure to be your lucky day! 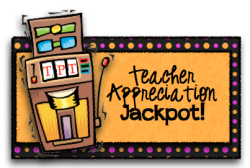 I’m excited to announce the very first Teacher Appreciation Jackpot, an amazing “blog hop” event involving over 130 bloggers! We wanted to show our appreciation for you in a BIG way, so we’ve all agreed to give away one of our TeachersPayTeachers products for free on that day! Each free gift will be valued at between $3 and $8, so the total jackpot amount is estimated to be over $500! We’ll post the actual amount on Saturday, May 5th. 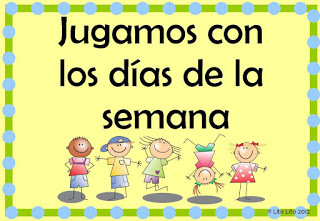 Three different centers and a printable craft for your elementary spanish students. Everything is done in Spanish and it has two levels for differentiating in the classroom. Download the preview to read about the centers. Thanks so much for all you do! We appreciate your commitment to your students and your dedication as an educator!